The perfect balance of sweet, savory, and spicy! Crisp and chewy Heiwa tofu is stir fried with a vibrant mix of our in-peak summer veggies (including green beans and pepper) and served over a bed of organic white jasmine rice. Corn tortillas (made by Tortilleria Pachanga) are stuffed with protein-rich black beans, fresh tomato salsa, sauteed veggies, and cashew-lime crema. P.S. 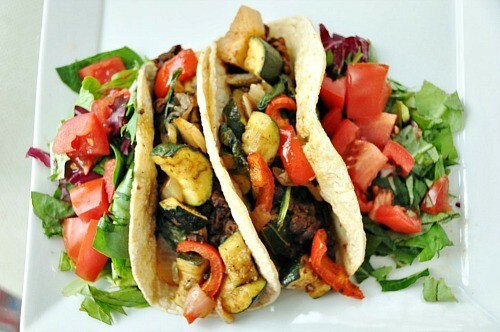 Love Mexican food? We have a few spots left in our Mexican Masa Fiesta cooking class on August 15, with the owner of Tortilleria Pachanga! Nothing beats homemade pizza! A chewy, whole-grain crust is overlaid with white bean spread, fresh herbs, and juicy veggies. Asian rice noodles are swirled together with ribbons of zucchini and carrots, studded with colorful veggies & herbs, tossed in a tangy peanut-lime sauce and sprinkled with roasted peanuts! Why roll your sushi when you can eat it straight from a bowl? Farm fresh veggies, local Heiwa tofu, avocado, pickled ginger, nori, brown rice in a sweet tamari sauce. A summer classic, this powerhouse of a salad can be eaten warm or cold. Quinoa, fresh herbs, cucumbers, our own nut-based "feta", oven-roasted cherry tomatoes, and lemon vinaigrette mingle together so that every bite is a delight! Warning: This Vietnamese-inspired soup just may be the best soup you've ever had. 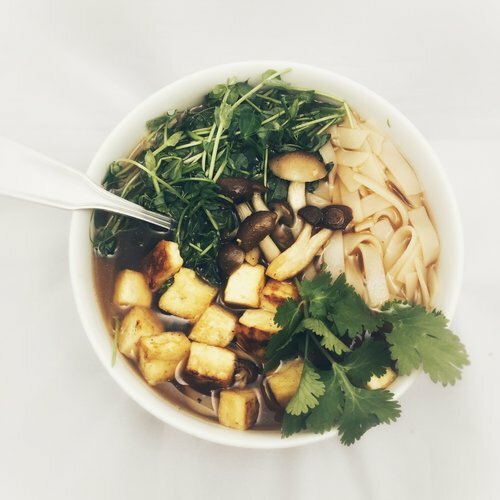 Slurpy rice noodles, crispy Heiwa tofu and local mushrooms, bright pea shoots and cilantro bask in a richly spiced (anise/clove/cinnamon) vegan "beef" broth. Say it with me now: "fuh"
Ever heard of Emmer? Didn't think so. Emmer is an ancient ancestor of wheat - high in protein and low in gluten, making it a great choice for people who are sensitive to more common, hybridized types of wheat. This scrumptious, salad is best eaten chilled, after the flavors of the fresh veggies, herbs, and lemon dressing have had ample time to mingle with the trio of proteins - emmer, chickpeas, and almonds. We like to make it in the morning and eat it for dinner! Our take on the traditional Hawaiian dish (which usually includes raw fish), this Poke ("Poh-KAY") Bowl is a veritable rainbow of color, flavor, and texture: our own fresh pac choi greens, caramelized pineapple, crispy baked tofu, brown rice, miso-ginger dressing, and topped with toasted sesame and nori strips. And while we didn't grow the pineapple ourselves, we are proud to say that two Maine-made products really make this dish shine: tofu from Heiwa (Rockport) and miso from go-en fermented foods (Whitefield). One of our signature FMK recipes, beet falafel is a tasty treat any time of year that beets are available - and lucky for you, we are just starting to harvest the first of our beets! Tender, baked falafel patties are adorned with a green goddess dressing and pickled veggies, atop a bed of cous cous. Beet falafel, green goddess dressing and pickled veggies, atop a bed of brown rice. These organic whole-wheat trumpet-shaped noodles by Sfoglini (Brooklyn, NY) are good enough to eat on their own, but when they are smothered in a creamy, cashew-based alfredo sauce, life takes on a whole new meaning. Toss with some minced chives and sauteed rainbow chard for a new take on comfort food! 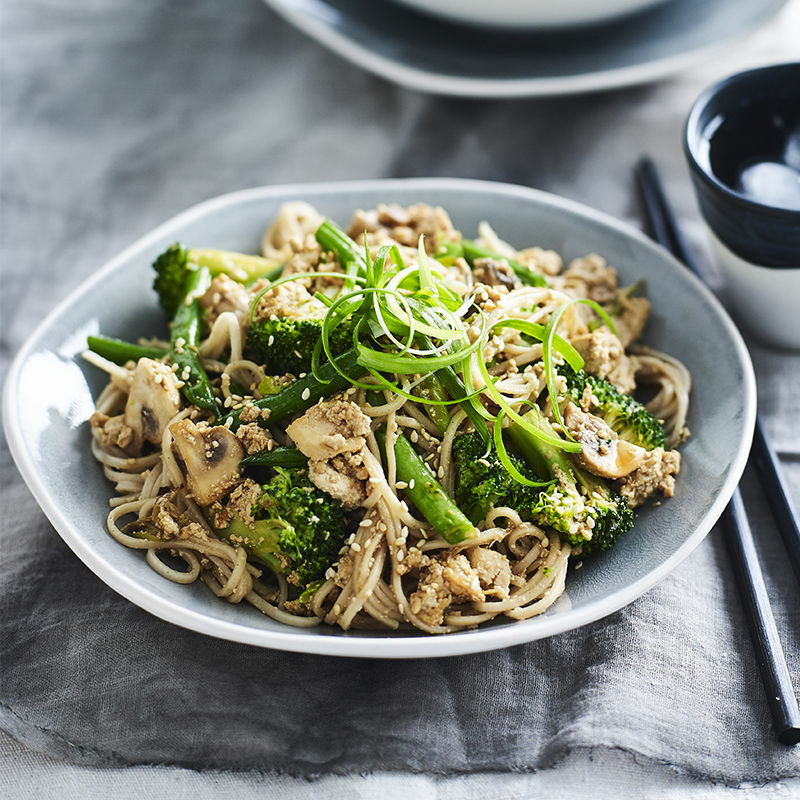 The same dish as Choice A, but with rice-based pasta for a gluten-free meal. We firmly believe that peanut sauce can go with anything, but there are some matches that are really made in heaven, and peanut sauce + red lentils are one of them. Simmered with an assortment of veggies, including local organic spinach, and served atop a fluffy bed of white jasmine rice (organic, grown in CA), this meal makes the perfect breakfast, lunch, and/or dinner! As we plunge into the craziness of the farming season, we will be taking a one-week break from Meal Kits, and will be back with a new menu for June 8, which will be posted by June 1. Thanks for understanding and see you soon! Chewy, earthy wild rice (hand-harvested by our friends in Minnesota) and local soldier beans (Baer's Best, Berwick ME) are simmered in a flavorful vegan beef broth along with veggies and spring greens. All your nutrient, flavor and texture needs in one soup bowl! The food world is all abuzz about jackfruit! Simmered in Jamaican jerk seasonings, jackfruit will meet roasted sweet potatoes, pineapple, and cabbage slaw, and together they will make their way into your mouth via organic corn tortillas from Tortilleria Pachanga (Portland, ME). And your life will never be the same. Fiddlehead season is a fleeting moment in New England, celebrated with much anticipation by anyone who has tried these immature little ferns. Never had one? Here's your chance. Creamy rich quinoa is studded with baked Heiwa tofu and garden chives, enhanced with a lemony dressing, and finished off with the star of the show - wild-foraged fiddleheads. This egg-less frittata gets its secret power from chickpea flour and is loaded with caramelized onions, spinach, and Italian-inspired herbs. Top it with some housemade marinara and a sprinkle of flavorful, dairy-free parmesan. Note: You will need a small (approx 8") oven-safe skillet or saucepan OR a standard-sized loaf pan for this meal. As evidenced by those cute little feet in the photo, this dish is a family favorite and always a hit with kids ages 1-101. A base of pumpkin-ginger-rice soba noodles is loaded with chickpeas, peanut-lime sauce, and a colorful melange of veggies. Enjoy the sweet, earthy flavors of sweet potatoes, parsnip, beets, potatoes, onion, and garlic, roasted to perfection. Combine with a bed of chewy Forbidden Black Rice (organic, CA-grown), a dollop of creamy Cinnamon Maple Tahini sauce, and a sprinkle of toasted pumpkin seeds for a lovely last hurrah with winter root crops. Please PRE-ORDER BY SUNDAY MIDNIGHT for a Friday pick-up at Quest or Frinklepod. Please note that our new schedule begins this week. The pre-order deadline will continue to be Sunday midnight each week, but Kits will now be available for pick-up on Friday mornings starting at 8am at both Quest and Frinklepod. You can pick up anytime (or day) after that (note hours of operation for both locations here). This schedule will continue through the summer. Also known as "bok choy," "chinese cabbage," and "soup spoon," pac choi is a nutrient-dense green and crunchy powerhouse that also happens to be growing like gangbusters at Frinklepod right now! This sweet & crunchy green communes with crimini mushrooms, cashews, and onions in a brown ginger sauce, all paired with tangy pickled carrots, lacto-fermented by Gracie's Garden (Standish, ME) over a bed of white jasmine rice. This scrumptious, salad is best eaten chilled, after the flavors of the red pepper, parsley, scallions, and preserved lemon dressing have had ample time to mingle with the trio of proteins - emmer, chickpeas, and almonds. We recommend making it in the morning and eating it for dinner! Please PRE-ORDER BY SUNDAY MIDNIGHT for a Tues. (May 1) or Thurs. (May 3) pick-up. What happens when you cross crispy-chewy Heiwa tofu with flavorful, spicy buffalo sauce, fresh spinach, cucumbers, avocado, and brown rice? PARTY IN YOUR MOUTH. Disclaimer: No buffalos or any other animals were harmed in the making of this dish. Parsnips are one of those truly seasonal vegetables, that you will only find in the fall or the spring, unlike, say, their cousin the carrot. When dug after a long cold winter, parsnips have a rich sweet flavor that just can't be beat. For this meal, you'll roast parsnips, carrots, onions (etc.) and blend them with some creamy cashews into a heavenly puree. Top with fresh parsley and some of our famous bagels-turned-croutons, and we guarantee you'll be licking your bowl clean!